Life is Reserve Order Today! COMMUNITY GUIDE Your Local Ad inandSiGralver CiBusiness ty nt County Now in the New Annual Life is Good in Silver City Magazine 2019 - 2020. CALL TODAY! ronmental hazards – the dust, the water which is trucked in, the glue in the scraps of plywood that people use for firewood, the sewage, waste and trash. I’ve never seen a government medical clinic in this area, so people who are sick either must wait for the SPJ clinic or deal with a complicated and lengthy process of bus rides into central Juárez. SPJ is building a gymnasium to allow students to play basketball, use an exercise room and have a stage for theater and musical productions performed by local kids. The mercado has space for 20 vendors who sell day-to-day essentials like school supplies, maintain a bakery or hair salon and, in general, create local jobs so residents can shop here rather than making a lengthy and expensive bus trip into Juárez. “Life is Good in Silver City” is a full-color, glossy Walker 575-933-8193 To orderguide, yourserving local business ad today, contact Mariah Mariah community as a valuable resource Full Page 4 col x 8.875” (6” x 8.875”) $895 Mariah@desertexposure.com Walker: 575-993-8193 Mariah@desertexposure.com book for residents and businesses, a helpful tool for $595 newcomers andExposure a vital handbook for visitors in a Half Page (Horizontal) 4 col x 4.375” (6” x 4.375”) or Desert Advertising Coordinator handy 7x10 size. 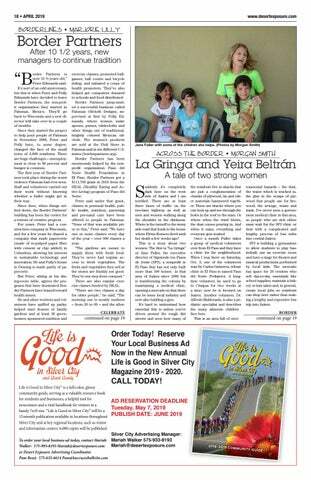 “Life is Good in Silver City” will be a 12-month publication available in locations throughout Silver City and at key regional locations, such as visitor and information centers. 6,000 copies will be published. NM Gross Receipts Tax will be added.